A2 Record Gothic is a revival of Ludlow’s Record Gothic typeface dating from c.1920s and c.1950s. This is our attempt to unify and systemise the disparate font styles – bold, wide, condensed and extra condensed to name a few – that were added to the family over the years by the Ludlow Typograph Company. Originating in the late 1920s as a ‘copy’ of American Type Founders News Gothic (1908) by Morris Fuller Benton, Ludlow’s Record Gothic existed as a stand-alone font in a single weight for many decades. Additional styles were added in an ‘ad hoc’ fashion, by many different hands, over the coming decades, with each new iteration taking on the stylistic quirks of their time. As a result, Ludlow’s unusual hybrid family has produced a rather charming anomaly in the annals of type. These days, we expect informational content to be set in sans-serif type. Of course, considering the 500-year history of typography, this is a relatively new paradigm, but it’s now so ingrained in the minds of Western readers it’s as if it was always so. Those seeking familiarity and neutrality often reach for the neo-grotesque (e.g. Helvetica) and humanist (e.g. Frutiger) genres, but it is the American gothic of the early 20th century that is perhaps the most utilitarian and least pretentious of the sans classification. As of 1930, in many parts of the Latin-writing world, the sans serif had begun to establish itself as a common type style. No longer a “grotesque” oddity reserved for posters and other display uses, the sans was now considered a clear and readable workhorse, capable of replacing serif type entirely. This was especially true in North America, where Morris Fuller Benton had devised a wide range of workmanlike sans serifs for the American Type Foundry. By the mid-1950s, ATF’s gothics had coalesced as Alternate, Franklin, and News Gothic, multipurpose families with a size, weight, and width for nearly any purpose. And, indeed, they were used for almost everything. Pick up any magazine, newspaper, book jacket, record cover, or all manner of corporate collateral and it was likely to include gothic type. 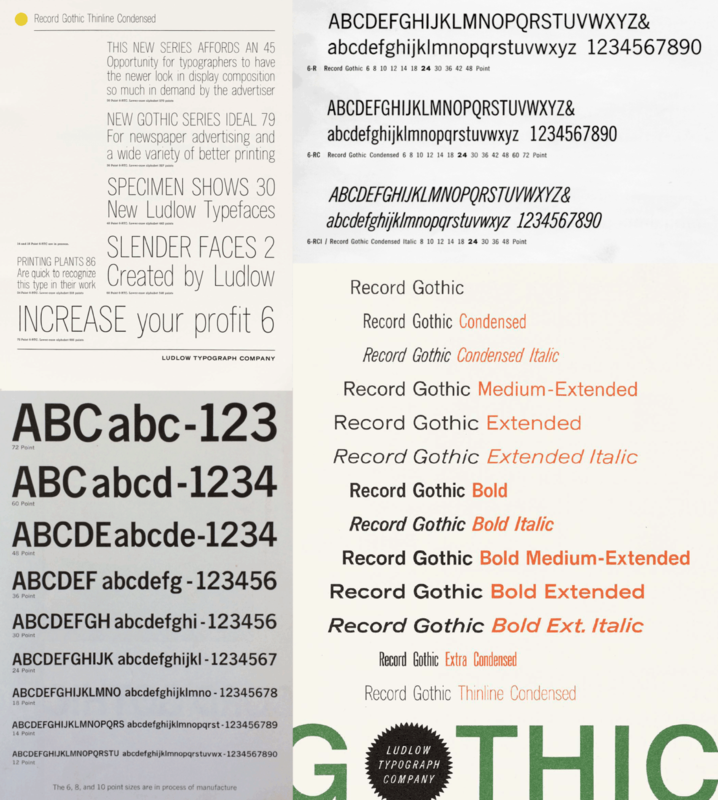 Much earlier, however, came Ludlow Typograph’s Record Gothic, first released circa 1927 in small sizes (6–12pt). Type historian Mac McGrew speculates that its name comes from its initial purpose: small headings on ruled record sheets. Over the next three decades, additional styles were added by many different hands, serving more diverse purposes, with each new iteration adapting to the fashions of its time — the Bold and Heavy Condensed can be compared to Akzidenz-Grotesk and Folio, the Medium-Extended is akin to Helvetica. As a result, Ludlow’s unusual hybrid family is a rather charming anomaly, one that has gone unnoticed among contemporary graphic designers because it hasn’t been properly revived – until now. Our interpretation, A2 Record Gothic, focuses on the pared-down initial cut, with its clear forms and economical stature. We expanded it to seven weights, Thin to Black, and gave them character sets sufficient for modern use, including text figures, fractions, arrows, and extended Latin support. Each weight has a corresponding italic with an unusually steep angle, echoing Ludlow’s original matrices and producing a striking effect when used for emphasis or display purposes. Each weight is also available in two additional widths, Condensed and X Condensed. In celebration of Record Gothic’s eclectic history, we designed four related but independent styles: Slab, Mono, Stencil and Outline. As a whole, the A2 Record Gothic system pays tribute to the eccentricity of its source, while hearkening back to the attributes that made the gothic genre so successful in the first place: plain-spoken utility. Sample preview of historical references from the A2-TYPE specimen archive and the Letterform Archive in San Francisco. All rights reserved.